Barefoot Massage dates back centuries. It’s believed that it was first developed in Kerala, India 2000 years ago by practitioners of martial arts and used as part of their training to increase flexibility and to increase recovery time from injuries. The barefoot technique utilized is known as “Chavutti Thirumal” which translates into "foot pressure" in the Malayalam language. This form of barefoot massage is performed on a floor mat, while the practitioner holds onto a rope for balance and support. The practitioner glides vigorously over the patient's body with a generous amount of medicinal herb infused coconut oil. The study and practice of Chavutti Thirumal is all encompassing and involves several levels of training and application. The practice of Barefoot Massage soon spread to other parts of Asia. In Japan it is known as Barefoot Shiatsu. An extension of traditional Shiatsu, which uses the hands and fingers, barefoot Shiatsu employs the feet to apply pressure to various points along the body. Correct application will restore imbalances and open up energy channels. This form of barefoot massage is performed on the floor while the practitioner holds onto a bamboo stick or chair for support and balance. Practitioners work through the client’s clothing and focus on the pressure points relating to the balance and circulation of Chi (energy). The practice of Barefoot Shiatsu involves much more than just bodywork, it's a whole body approach that follows the principles of TCM which takes diet, breath, nutrition and posture all into consideration. Throughout the centuries many forms of ancient barefoot massage have evolved and spread all over the world. In Thailand, therapists have used their feet for hundreds of years to stretch and compress muscle tissue. In Hawaii, Kua Lua back walking stems from an ancient martial art. This form of barefoot massage is a spiritual practice for native Hawaiians. Therapists utilize a bamboo stick for support and balance while employing pressure along the back and spine. Fijian barefoot massage is performed without bars, overhead ropes, or oil. The technique mirrors sports massage and is performed on the floor in seated and standing positions. Each barefoot technique is uniquely beneficial and considered a healing art form. Most of these modalities are inherited from ancestors who pass down techniques by word of mouth from one generation to the next. The original learning standards and methodologies for the Ashiatsu Deepfeet Bar Therapy barefoot curriculum were developed and synthesized by Ruthie Piper Hardee back in the early 1990’s. After graduating from massage school and beginning her career as an LMT, it wasn't long before she felt the repetitive compressive movements from deep tissue bodywork start to take a toll on her wrists, thumbs and especially her low back. Ruthie then began to imagine and explore the combination of deep tissue and effleurage techniques utilizing her feet for the work instead of her hands. At that time there were no western barefoot massage practitioners and educators utilizing an overhead bar system for support. Ruthie Piper Hardee grew up in a family dynamic where helping people overcome pain was the norm. 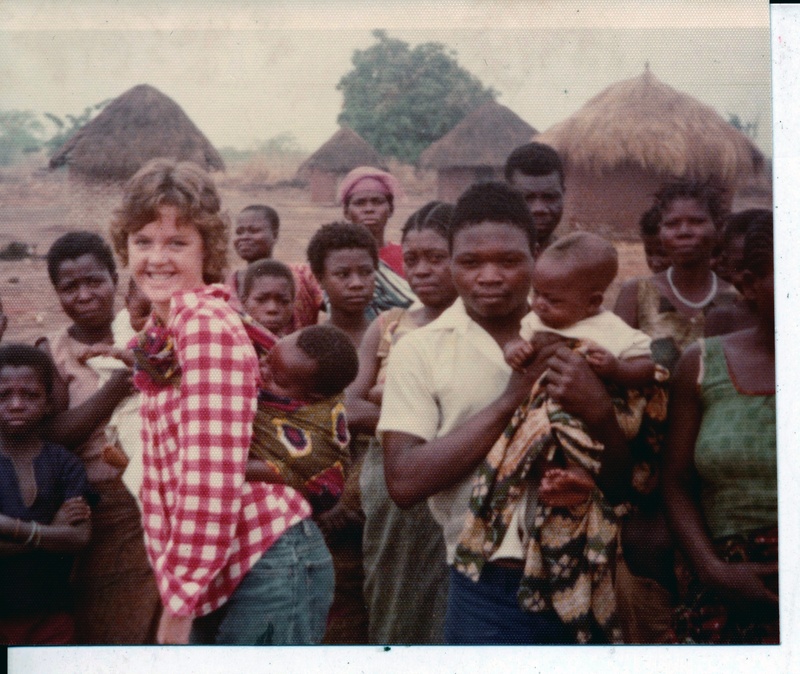 As a young girl, Ruthie traveled extensively throughout rural parts of Africa and Asia with her parents who were medical missionaries. Ruthie's father was a doctor who specialized in tropical disease medicine and her mother, born and raised in the Belgian Congo later became a nurse. Her grandparents pioneered a thatched roof medical dispensary in a jungle village (Kapanga) back in 1913. This dispensary would later serve as a trauma center for the Lunda tribe and beyond. 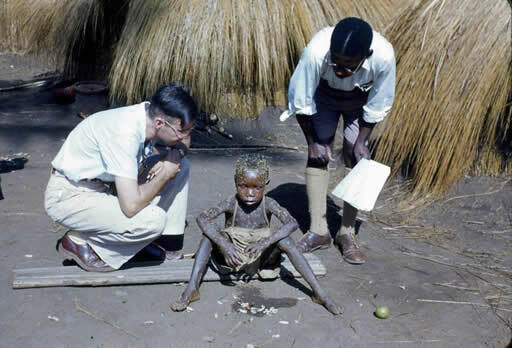 Ruthies family were the only Westerners providing modern medicine in the region at the time. Ruthie was a young girl when she caught her first glimpse of barefoot massage in an open air market in Manila, Philippines. There she observed women performing barefoot massage on men lying on army cots. Several of the practitioners would hold onto a long pole that spanned the length of the grass-roofed pavilion. A few years later in India outside a Vedic temple in Delhi and again by a stroke of luck, she witnessed a version of a barefoot Chavutti Thirumal ritual being performed. Little did she know at the time that these experiences would later form her epiphany and serve as inspiration to develop a western form of barefoot massage nearly thirty years later. Before becoming a therapist, Ruthie worked in Hollywood in the television and film industry in the late 80’s. During the Writers of America strike in 1989, she took time out to learn a new vocation and enrolled in massage school. After graduating she worked part time as an on-site massage therapist on TV and movie productions. Her idea for Ashiatsu hit her one day after performing a grueling ten hours of bodywork working out of a grip crew trailer. Her last client that day (a large stunts actor) had requested deep tissue work and with her hands and wrists already exhausted, she reluctantly agreed. A few minutes into the massage she noticed some metal lattice grids attached to the ceiling of the truck that stored coiled cable wires. It was there in that trailer when she first stood up on the massage table, stuck her finger tips through holes in the lattice to hold on and started using bodyweight and gravity to deliver traditional Swedish effleurage with the soles of her feet. After that day Ruthie's goal was to convince all successive clients of her newly found technique and most importantly to develop a support system that is both smooth and comfortable for therapists to hold on to. Through the natural progression of critical thinking and extensive research, Ruthie pioneered a gravity-assisted barefoot massage curriculum that was unique and brand new to the massage industry at the time. 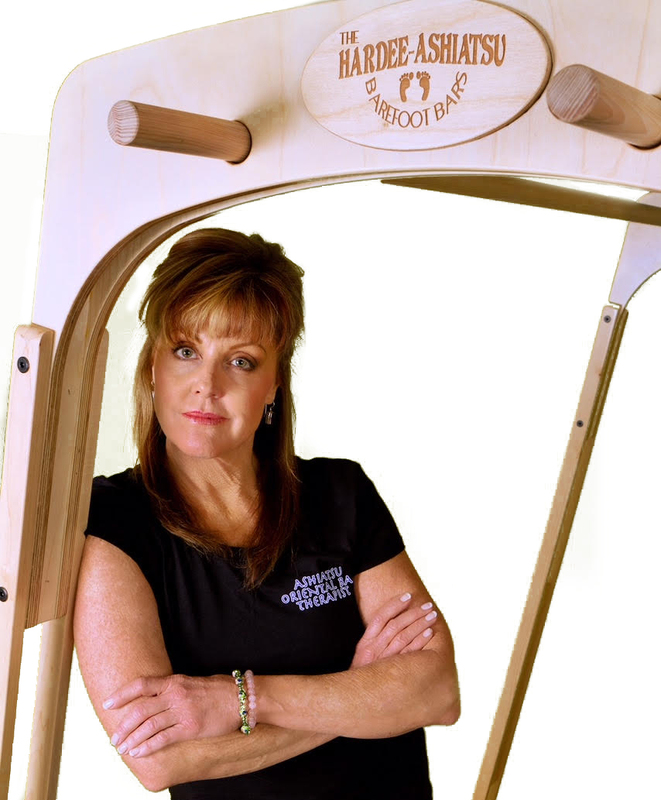 In addition to her curriculum, she also invented the Hardee-Ashiatsu Portable Bar apparatus, which is now distributed and utilized by barefoot practitioners all over the world. Fast forward nearly thirty years and you will still find Ruthie speaking at tradeshows and instructing Ashiatsu out of her training studio in Denver, CO. Today, her curriculum is enriched and expanded by her current dedicated instructor team who share the same love and and passion for barefoot massage that Ruthie pioneered decades ago. Check out our media page for videos and articles featuring Ruthie Hardee.